Some SUVs are just a tad too large for the city. However, the 2019 Ford EcoSport is sized just right for urban environments. Good cargo space also helps make this compact crossover a practical commuter vehicle. Of course, a lot of drivers will appreciate the EcoSport's affordability. While the new EcoSport deserves a look, the competition is incredibly stiff. Will this city-friendly SUV meet your expectations? This year, Ford has added a few more standard features to the EcoSport. A Cold weather package is also no longer available for the 2019 Ford EcoSport. Although you can take a road trip in the 2019 Ford EcoSport, it's an especially good vehicle for metropolitan areas. You will have no trouble maneuvering the EcoSport around crowded city streets. Parking this narrow crossover also doesn't take a lot of effort. If you live in a snow-prone region, the optional AWD system will make your commute to work a lot more enjoyable. Some drivers will find the base three-cylinder engine to be a bit short on performance. To experience stronger acceleration, step up to the larger four-cylinder engine. It's rated to produce 166 horsepower and 149 pound-feet of torque. During rush hour, you'll appreciate the additional boost of performance. Merging onto the freeway and passing will be a lot easier. Along with the extra power comes a standard AWD system. Although the 2019 Ford EcoSport isn't as agile as a hatchback, it does feel quite stable. When taking curves, the tall crossover's body does not exhibit excessive body roll. A sports-tuned suspension is found on the SES model. One of the best aspects of the new EcoSport is its great driving position. You should be able to easily adjust the driver's seat to gain a good view of the road. A lot of drivers will like the EcoSport's contemporary styling. From the front, it looks like a more compact version of the Ford Escape. LED signature lighting comes standard on the upper trims. The SES and Titanium models are especially nice. A rear spoiler and blacked-out exterior treatments help give the EcoSport SES a very sporty appearance. Meanwhile, an extra amount of chrome accentuates the Titanium model's upscale styling. Some of the available paint colors include Canyon Ridge, Blue Candy, and Ruby Red. Prices for the 2019 Ford EcoSport start at around $20,000. This is a good price for a new crossover. Although the base S model isn't luxurious, it does contain modern features. Some of the most notable equipment includes Bluetooth integration, a six-speaker sound system with twin USB ports, and a rearview camera. Along with your purchase comes a 36,000-mile basic warranty and a 60,000-mile powertrain warranty. Sync 3 with Apple CarPlay and Android Auto is a must for technology lovers. You won't find a better infotainment system in the class. Not only is Ford's Sync 3 interface very responsive, but it also links to your smartphone without any hassle. All of your mobile apps will be a click away. Large icons and high-resolution graphics also make the 8.0-inch touch screen easy to read. Available as an option, pinch-to-zoom navigation enables you to clearly pinpoint destinations. The average driver will be perfectly content with the base sound system. However, you should experience the available B&O Play audio system. It's among the best sounding audio systems in the segment. A total of 10 speakers line the cabin to create a great music-listening environment. Because of the system's built-in amp, you won't notice diminished sound quality at high volumes. An equalizer enables you to dial in just the right amount of bass and treble. There's no overlooking the EcoSport's small dimensions. Fortunately, it actually feels bigger than you may think on the inside. Average-sized passengers will not find the crossover's backseat to be too confining. The EcoSport also provides a good amount of storage room. This is a huge advantage for the commuters who prefer an active lifestyle. When the rear seats are folded down, there's around 50 cubic feet of available cargo space. You will have no trouble stuffing extra gear into the back. The 2019 Ford EcoSport does have its fair share of blind spots. While the view out of the front windshield is good, large rear window pillars can hinder your ability to see oncoming vehicles. For this reason, it's a good idea to opt for blind-spot monitoring with rear cross-traffic alert. You'll be able to move about with greater confidence. Research shows that most people connect to the web on a daily basis. Luckily, the 2019 Ford EcoSport offers onboard Wi-Fi. It eliminates the hassle of trying to find a good Wi-Fi hot spot. Whether you need to send an email or update your social media, you'll be able to easily do so. Children will especially enjoy having quick access the internet. Ford rates the base three-cylinder engine to produce 123 horsepower. A vehicle that weighs in excess of 3,000 pounds needs more muscle under the hood. When accelerating with other passengers inside, the 2019 Ford EcoSport will leave much to be desired. It'll take you around 11 seconds to hit 60 mph. If you desire a peppier performance, choose the four-cylinder engine. The 2019 Ford EcoSport is relatively efficient for a crossover. However, it takes a backseat to the competition. Even models equipped with the base engine don't deliver more than 29 mpg on the highway. Meanwhile, you can expect the four-cylinder EcoSport to deliver worse fuel economy in the city. Like the Honda HR-V, the Mazda CX-3 can easily return more than 30 mpg. There's no denying the helpfulness of the optional blind-spot monitor. 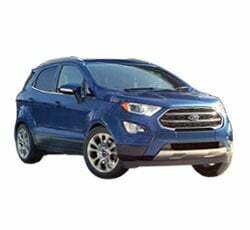 Unfortunately, Ford does not offer any other advanced driving aids for the 2019 Ford EcoSport. Some of the EcoSport's rivals actually come standard with safety technologies like automatic emergency braking. The 2019 Ford EcoSport has an average predicted reliability score. It received a rating of three out of five stars. Drivers seeking great dependability should consider the 2019 Toyota CH-R, which received a 4.5 rating for its predicted reliability. A more precise automatic transmission would transform the EcoSport into a more responsive vehicle. Its transmission often struggles to choose between gears. Unfortunately, you don't have access to a manual transmission. The 2019 Ford EcoSport is designed to take on the 2019 Honda HR-V, which leads the class in several categories. Although the EcoSport offers mobile Wi-Fi and a great infotainment system, it doesn't provide as much passenger room as the HR-V. You can also get more safety features on the Honda HR-V.
You should also test out the 2019 Mazda CX-3. In terms of overall performance, the Mazda CX-3 runs laps around the Ford EcoSport. Drivers will also like the CX-3's stronger fuel economy and cutting-edge safety features. Cargo space is the only area the EcoSport outshines the CX-3. Some drivers may like the 2019 Chevrolet Trax as well. Although the Trax is not a better overall crossover, it does offer forward collision warning and lane departure alert. Although the 2019 Ford EcoSport may not be the best performer in the class, it still has some clear strong points. Drivers looking to budget their money wisely will like the EcoSport's attractive pricing. Premium features, such as Ford's Sync 3 interface and Wi-Fi connectivity, help make the EcoSport a very rewarding commuter vehicle. On the downside, the EcoSport sacrifices some fuel efficiency. When equipped with the base three-cylinder, acceleration is especially weak. Furthermore, blind-spot monitoring is the only advanced driving aid available on the EcoSport. Check out the competition before making a final choice.